Download "Apple Mac VPN Service Setting up Remote Desktop"
1 Apple Mac VPN Service Setting up Remote Desktop After you have successfully connected via the VPN client to the University network you will then need to make the connection to your machine. To do this you will need to know the IP address of your machine. Your desktop support team will be able to provide you with this information. (How to guide is provided below). To start the connection you will need to click on the Go tab on the top left of your desktop and then select Connect to Server. 1. On the below screen you can see the address typed as vnc:// There are basically 2 parts to this address: The vnc:// part tells the computer the protocol you would like to use. VNC is a remote access tool that is used for Apple Macs. The second part is the IP address of your machine which in the example below is though this will be different for every machine. In a nutshell you are telling the computer to connect the specified IP address using the VNC protocol. 4 7. Clicking preferences has useful options as below for security, visual quality and performance 8. The view tab also has options to change the screen quality and hide and customize the toolbar. Please note increasing the screen quality will slow down the responsiveness of the connection. 9. The toolbar can be displayed on the screen share window. Below you can see 2 icons highlighted which are Send clipboard contents to the remote computer and Get clipboard contents from the remote computer which will allow you to copy and paste items from computer to computer. This is very useful for example if you are going abroad and forgot to save an item to your USB pen drive. In some circumstances however this does not work. 5 10. If this is the case there is another utility which can give you this functionality. The following steps will need to be done on your University machine AND your home machine, if you do not administrative rights on your Mac you will need to log a call with support to install this for you Navigate to the above website, this contains a utility called clipboard sharing which allows you to send and receive your clipboard from a remote computer. Click the download link as below. 11. If using Safari the below window will be displayed giving you a progress bar. Once downloaded the utility by default will be saved in the downloads folder in your home directory. 8 17. When you have finished your screen sharing session, please quit the session as point 23 and remember to disconnect the VPN client. Please note while the VPN session is connected, you will not be able to browse the internet or any access any network resources you may have on your home machine. Note: Please be aware of the following When you remote in to your University machine from home you will not have the same responsiveness as if you were sat at your desk. For example there may be a slight delay when opening documents, browsing the internet etc. The speed of your internet connection is the main factor for slow performance/response when accessing your machine from home. Because you are accessing your machine via the internet, you would not be able to run programs such as Final Cut Pro without experiencing dropped frames etc. 9 For Desktop Support Use 1. Your UNIVERSITY MACHINE IP address can be discovered using the following: Go into System Preferences of your machine. This can either be done by clicking the Apple icon on the top left of your desktop and selecting System Preferences. Or, there may already be a System Preferences icon on your dock. 2. Once you are in System Preferences you need to click on the Network icon. 11 5. In the user accounts screen you may need to unlock the padlock to allow changes on the bottom left of the screen. You must specify an administrative username and password to unlock the preferences. Once the padlock is unlocked, (as below) click on the plus icon which will add another user account. 6. In the following window select a standard account with the name remote. Give the account an 8 character secure password. Click Create Account when the info has been entered. This can then be given to the end user for connecting remotely to the machine. 12 7. The remote account is now displayed on the left of the tab. 8. If the user is connecting from home another thing to check is the power options, as if the Mac powers down the user will not be able to connect to it. Go back into System Preferences and click on Energy Saver icon. 13 9. Set the computer to never sleep as sometimes the Mac will not wake up even with ARD. Set the display to sleep after around 20 minutes, this is important as it will stop the image on the screen burning into the display, also untick Put the hard disk(s) to sleep when possible as this can also make the computer impossible to remotely wake up. Once these options have been set, click on the options tab on the top of the screen. 10. Tick Restart automatically after a power failure, this will make all the boxes ticked. 14 11. 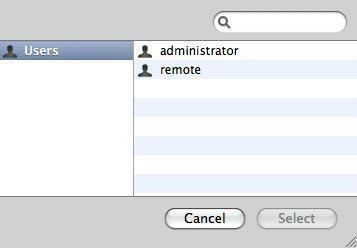 Once this is done you will need to set the remote management options on the Mac itself. Go back into System Preferences and select sharing. 12. 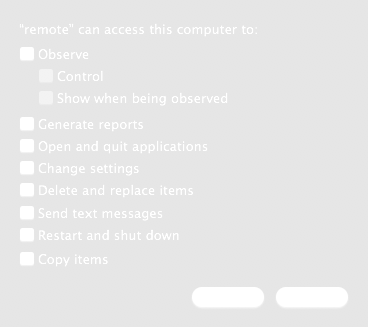 This will display the below screen, ensure that remote management is ticked as the arrow below. By default Remote management is allowed for all users however I would limit this to the administrator account and the remote account for security reasons as the administrator account is used by support officers and the remote account for the end user. To do this change Allow access for All Users to Only these users and click the plus icon as below. 15 13. This will display the below screen, the accounts here may vary but the administrator and remote account should now exist if configured by support. Here select the remote account and then click on the select button. 14. You will then get a menu with options to tick, here tick all options. 15. As below, then click on OK. Do this process for the administrator account also. 16 16. The screen should then look as below with allow access only for the administrator and remote accounts. Mac OS VPN Set Up Guide If internet traffic is not being sent over the VPN then go to System Preferences- >Network and click on your VPN connection. Click the "Advanced..." button, and in the "Options"
Accessing the Goldsmiths VPN Server on OS X (10.3 and 10.4) 1) Open up Internet Connect which can be found in your Applications folder. POLARIS INSTALLATION BELS runs the Polaris 4.1 Integrated Library System (ILS)- the same system as BCCLS. BELS users will connect to Polaris via a terminal server using Remote Desktop Connection (RDC). Getting Started Guide Cloud Server powered by Mac OS X Getting Started Guide Page 1 Getting Started Guide: Cloud Server powered by Mac OS X Version 1.0 (02.16.10) Copyright 2010 GoDaddy.com Software, Inc.